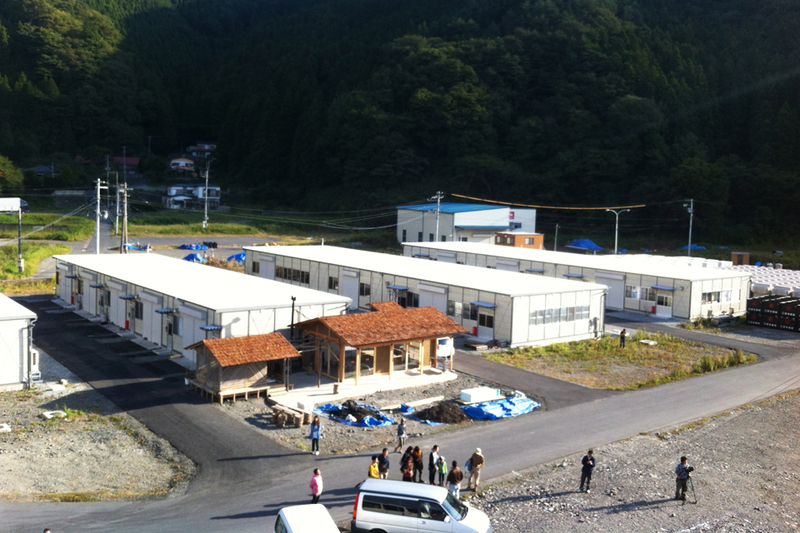 The Fisherman’s Union of Shinhama-cho, Kamaishi City, Iwate Prefecture was about to resume meetings after a hiatus caused by the March 2011 tsunami that hit Japan’s Tohoku region. But, their former office was destroyed and they were struggling to a find a large enough community space to meet with fellow fishermen, town residents, and visitors. 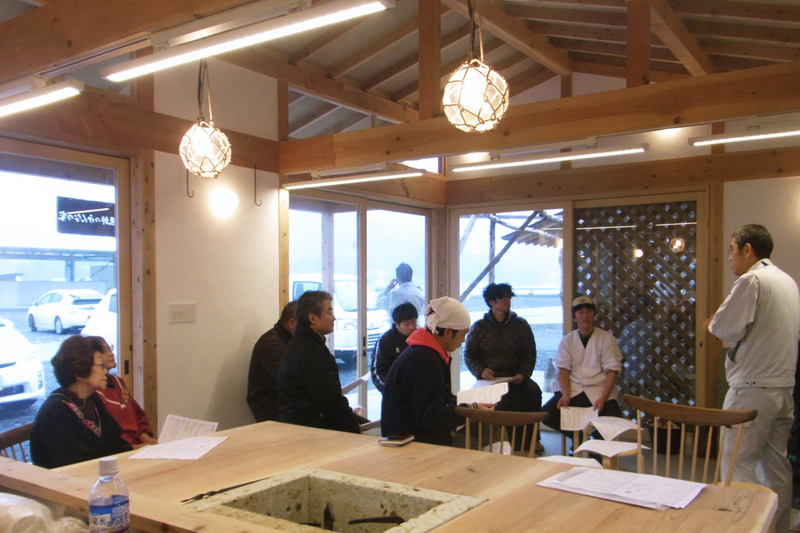 This is when the vision for the Home-for-All for fishermen in Kamaishi was born. 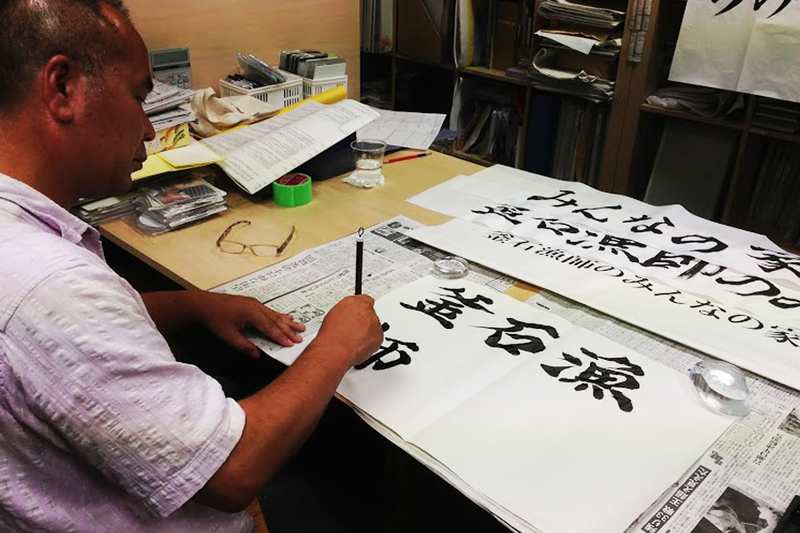 NCS looks forward to collaborating with Kamaishi residents and the Fishermen’s Union in creating a symbol of Kamaishi’s economic revitalization. Local residents and a well wisher who provided stoves and facilities gathered together, and we held a briefing session about their use. 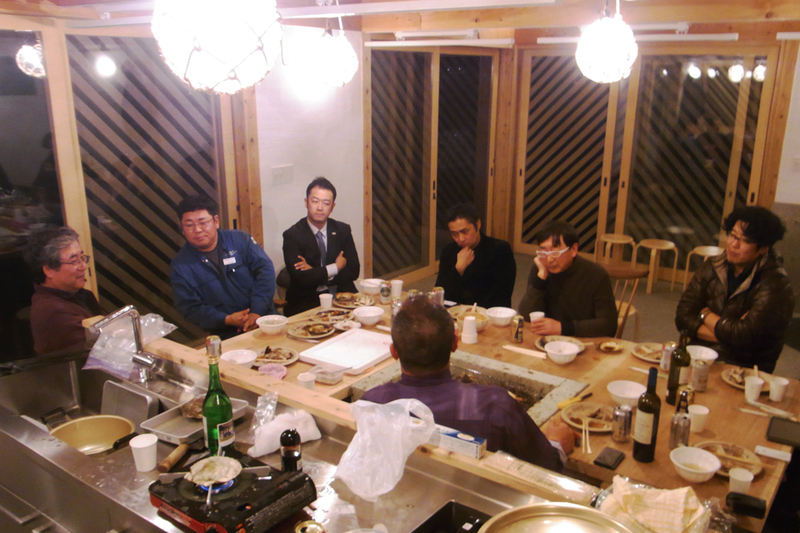 Upon conclusion, we had a small party by sitting around the hearth of the Oyaishi and eating delicious fishery products of Kamaishi. We hope that they will be able to use it in a similar manner going forward. 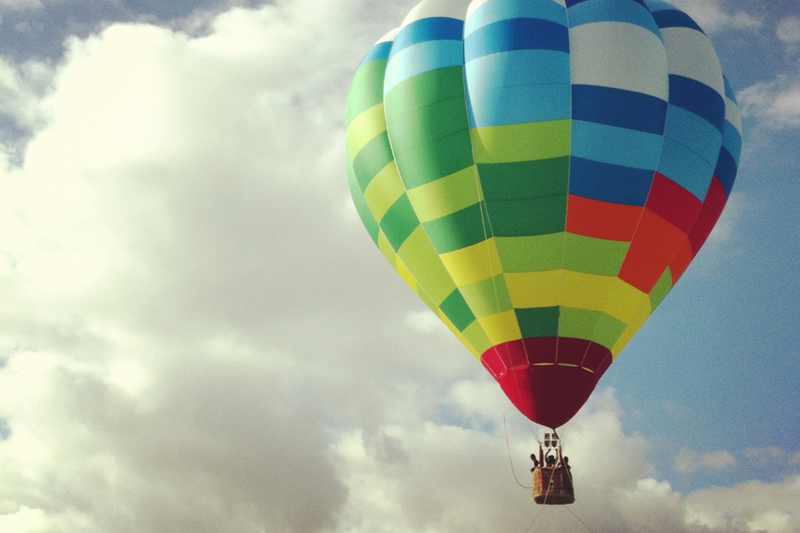 Two staff stayed and when we went to the site early in the morning to readjust the building and clean up, the balloon experience event was held in front of us and we had a chance to ride in a balloon. We had and ariel view of the house which harmonised well with the landscape. 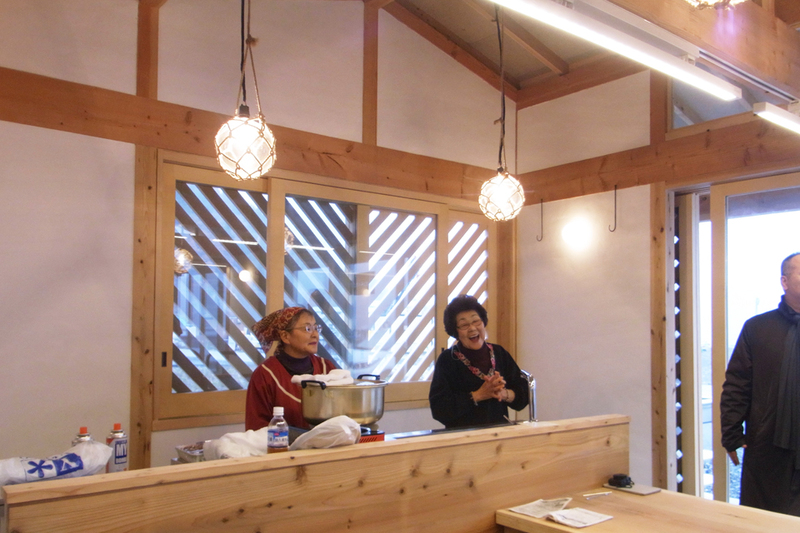 The event organisers were people of the balloon team of Kamaishi-shi and its sister city of Yokote-shi. 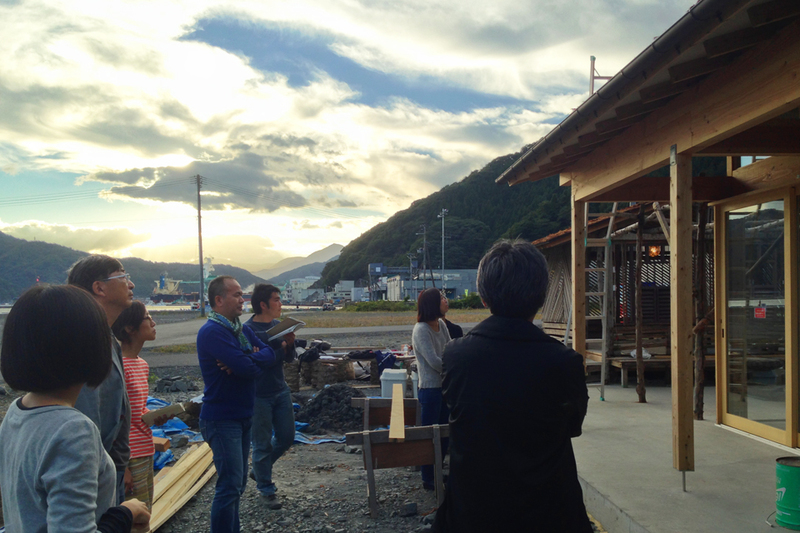 Toyoo Ito, the architect, Jun Sato, the structure artificer, Yamashita, the representative of our group, and other staff gathered in Kamaishi and inspected the building upon completion. 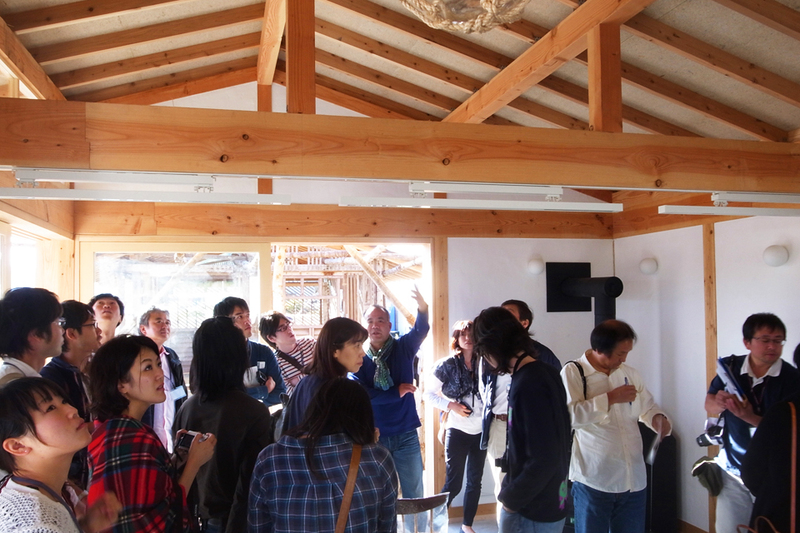 It was the day of “Open house” tour by Ito architecture private supplementary school, and many people came to see the newly completed house. Small forged steel articles arrived today from Jun Tanaka of SAHI, and we installed them straight away. 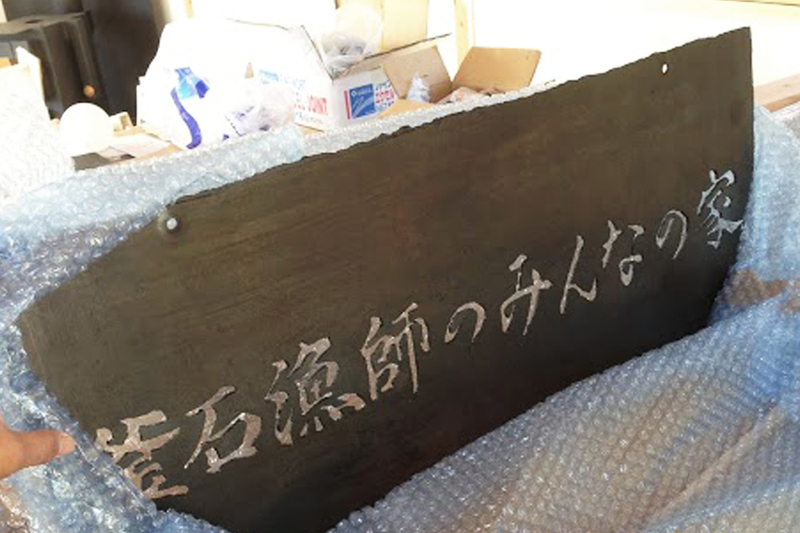 The signboard was designed based on Yamashita sans calligraphy, it is finished in matt black with beeswax and is a fitting ornament for the design and atmosphere of the house. Tanaka san made the fish spits and hooks as well. 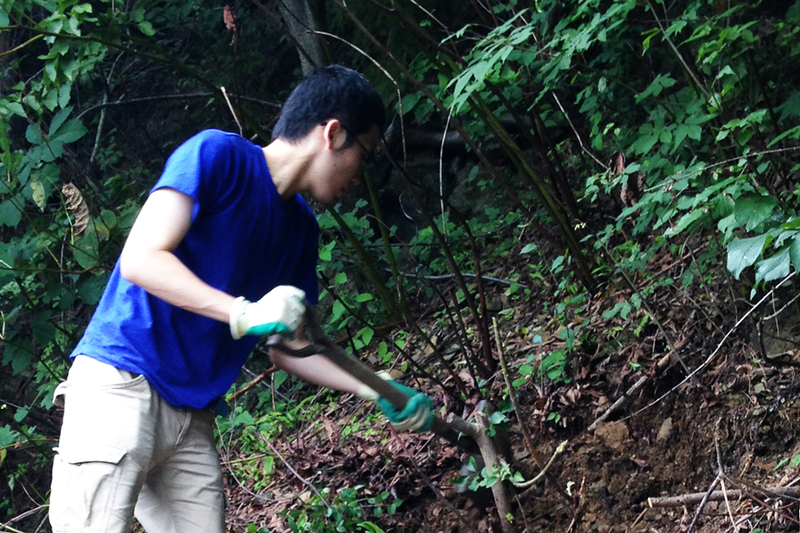 We peel cedar bark in Unosumai today, too! It is good weather this time again. 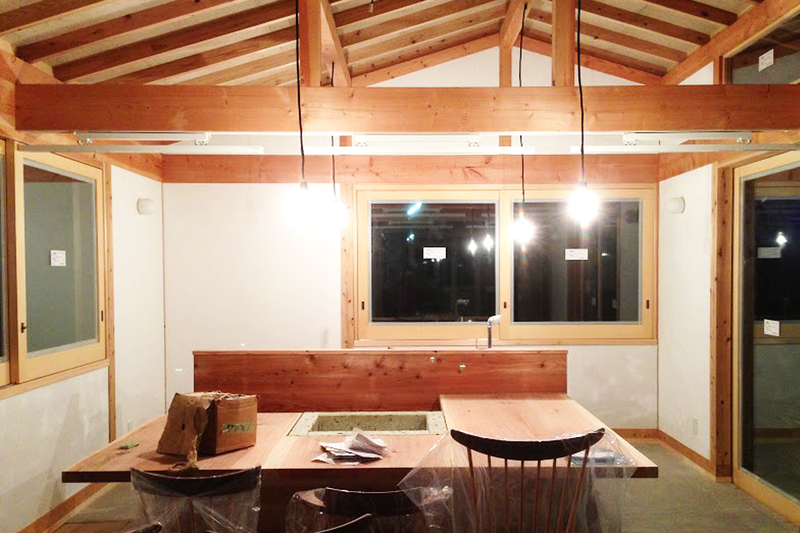 On the other hand, in the construction site of Home-for-All for fishermen in Kamaishi, lighting and furniture were put, the fixtures were installed, and it is approaching completion rapidly. The cedar bark which we peeled for days covered the roof. We used to see the cedar bark as the roofs of the gate of shrines or temples or the house, we can rarely see it nowadays. It brings back a nostalgic warm feeling looking at such a roof. 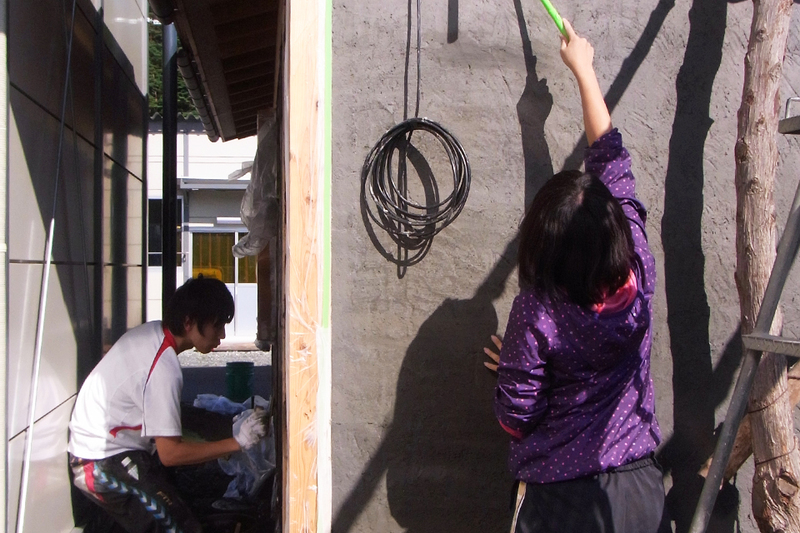 While a typhoon was approaching, we finished last coat of the earth wall. 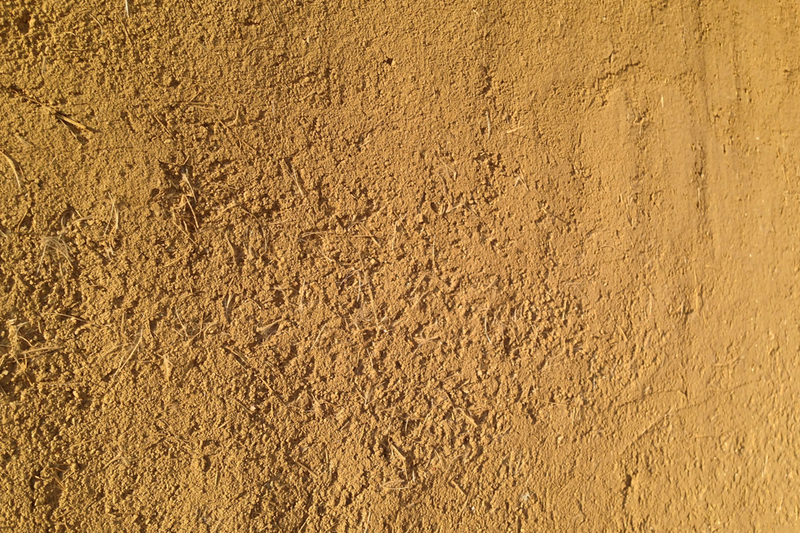 On the gray color wall, we apply the plaster of the diatomaceous earth for the inner wall, soil tinged with the yellow for the outer wall with the trowel. Because the last coat will become the final coat, all are serious! We hope it would not be spoiled by typhoon…it is raining. 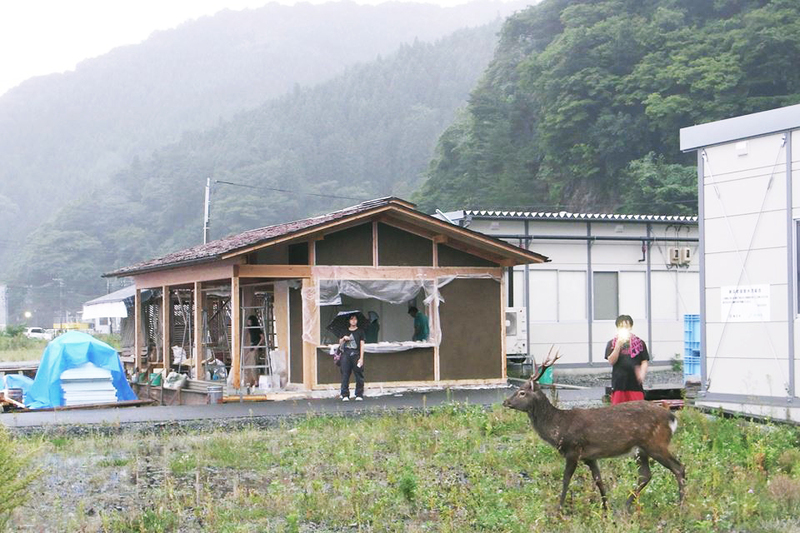 We finished early and cleaned up because wind and rain were intensifying, a deer came to the site. Various people such as a couple taking a walk and the neighbouring fishermen's cooperative association come to take a look, and greet us as we worked on the site. We hope this becomes a base where people gather easily and creates a lively atmosphere for the region. 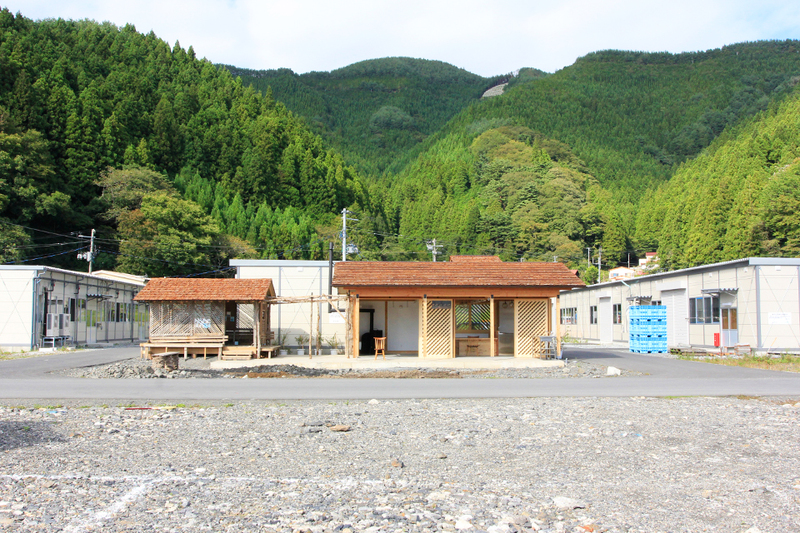 While we are waiting the undercoating to dry, we borrowed the place of the Kamaishi district forestry owners' association in Unosumai and held a workshop for peeling cedar bark. We did it in the beginning of August, however, total amounts of the bark using for the roofs both main building and Bahrain are approximately 2,500 pieces. Therefore, we need to peel by hand to make up for insufficient amount in the heat of late summer. You can peel the bark neatly if you discover the point that is easy to come off. 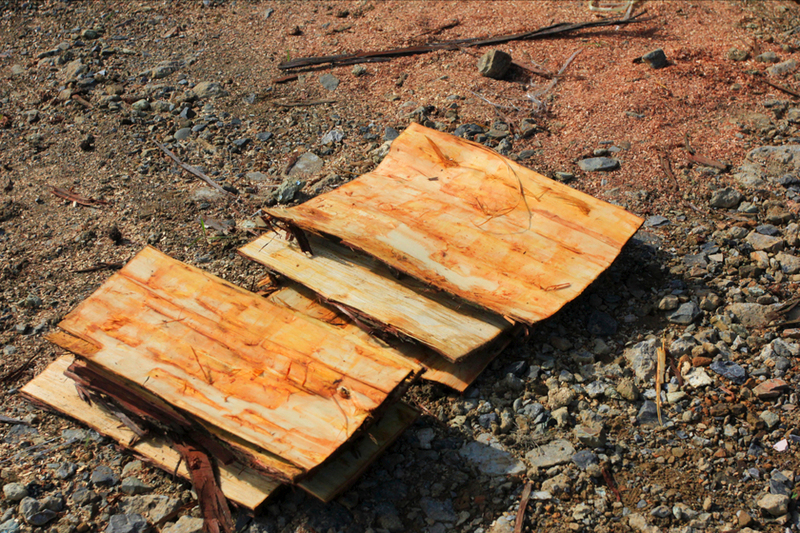 The just peeled log of the cedar is soft and smooth and smells good. 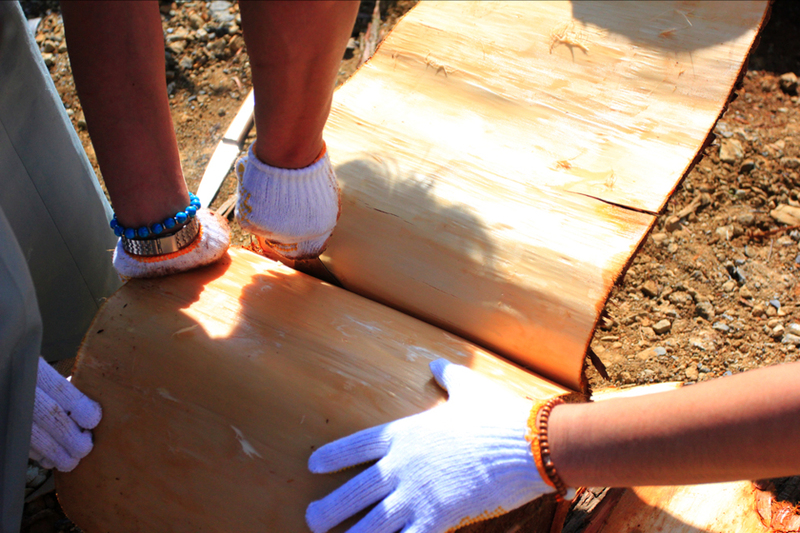 Though it was unexpectedly hard work to cut down the skin from a log with a spatula and a saw, volunteers worked with pleasure while talking each other. 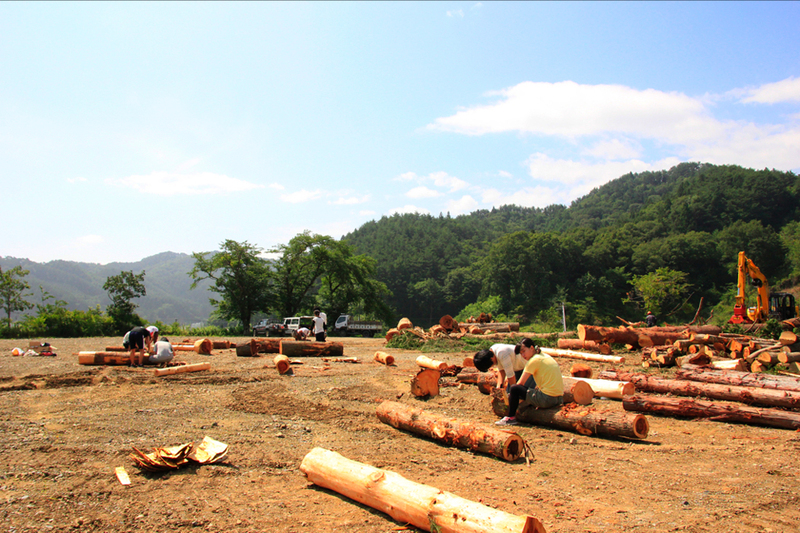 It is easy to peel a log which is getting wet, but, fortunately or not, we have fine weather every time on the day of the workshop. We started undercoating at last! The plasterer experience is particularly popular among the numerous construction workshops. 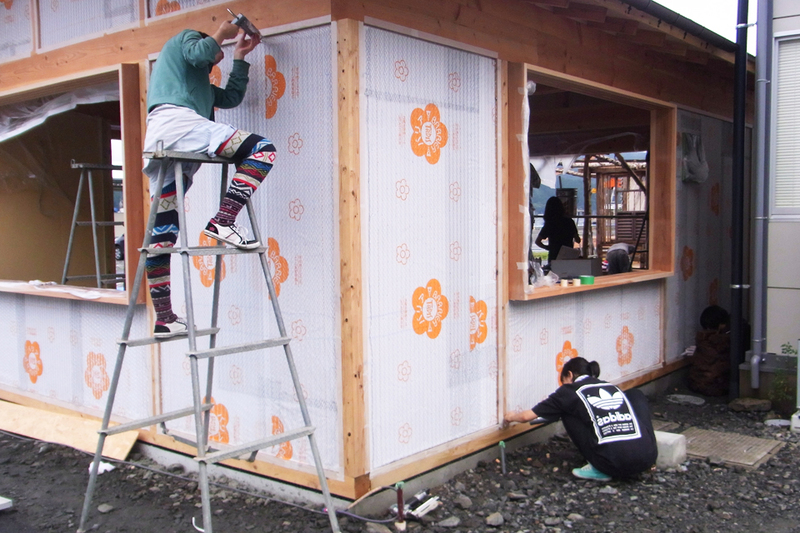 Under the instruction of Mr. Shibuya from Shibuya Seisakusyo, who provided the materials, we worked hard in the rain and finished coating within the schedule somehow. After finishing the undercoating, we are going to apply a last coat after drying for about a week. If you apply the last coat while it is still wet the surface becomes easy to crack. At the moment it has a gray appearance and looks like the concrete. 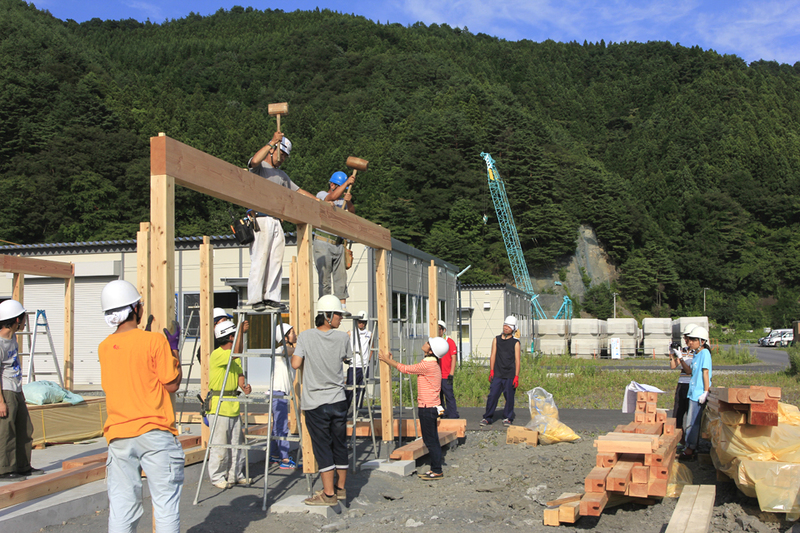 For the earth wall coating workshop which began on September 8, the staff and four students as volunteer visited Kamaishi early and carried the soil. 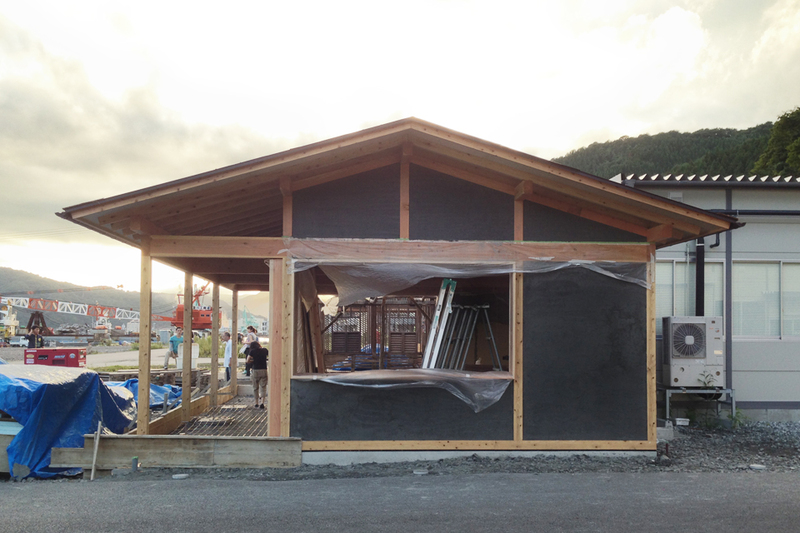 At Home-for-All for fishermen in Kamaishi, local soil is used for the under coat of inside wall, the under and last coat of outside wall. 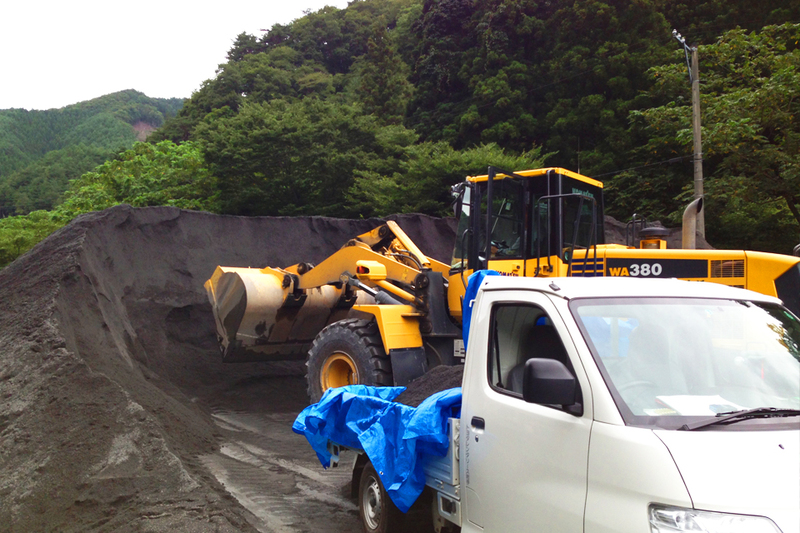 We used abolished clay from the sand pit for the under coat, and clay for the last coat was shared by the neighbor as a favor. The wall is going to be completed in a tasteful old fashioned style in a yellowish tint. The roof-laying ceremony was held. 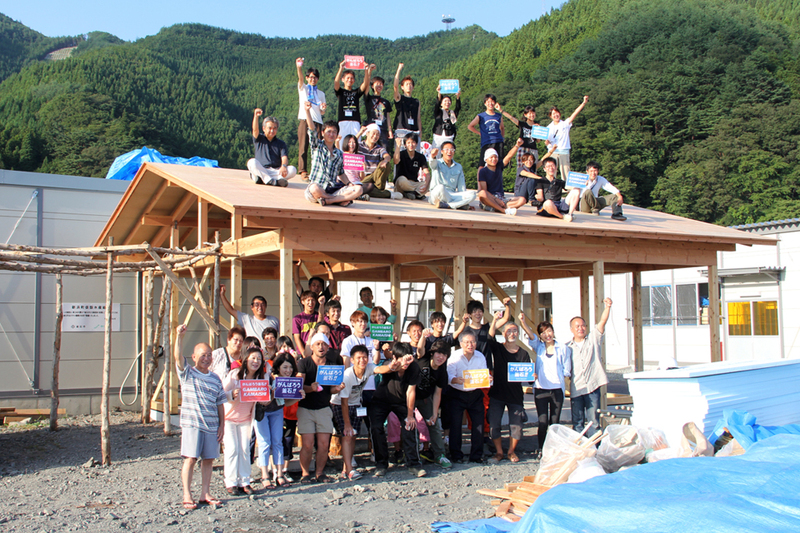 Town residents in Kamaishi, students from Kyusyu University, Aichi Shukutoku University, Yokohama National University and Ito-kenchiku-juku, Tono Magokoro Net, Tohoku-kaikon, Toyo Ito & Associates, Architects + TeMaLi Architects, a total of 50 people gathered. After the ceremony, we enjoyed soup with savoury paste and squid sashimi served by Women's Bureau of Fisherman’s Union and seafood BBQ by the young administration members. The ceremony for the completion will be held on Saturday September 28. 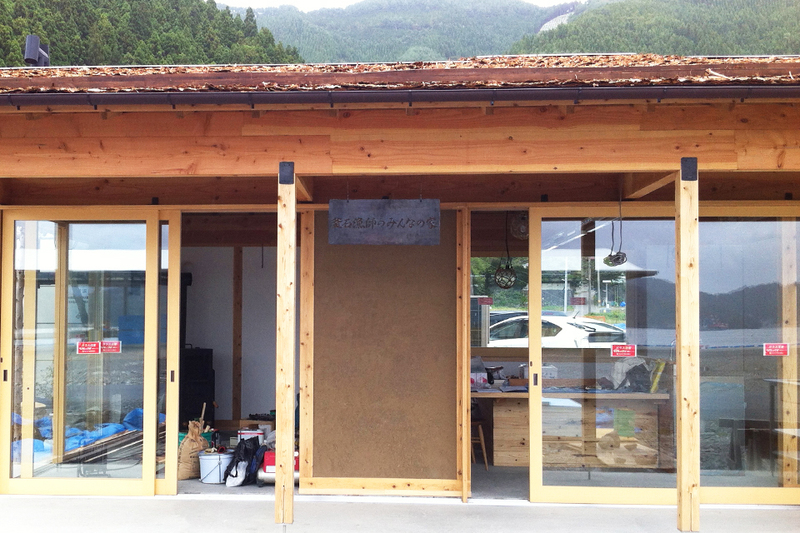 On August 2 and 3, we rented a place from the Kamaishi district forestry owners' association in Unosumaicho Kamaishi City, Iwate for two days and held a workshop for peeling cedar bark to use for the roof. Under the instruction of Mr. Shibuya from Shibuya Factory, 10 local residents in Kamaishi, 9 students from Tohoku University and Yokohama National University, one student from Ito-kenchiku-juku(architectural cram school), one from NPO Tohoku-kaikon(reclamation), and 3 from Ito office + TeMaLi Architects participated and peeled cedar log in the summer heat. 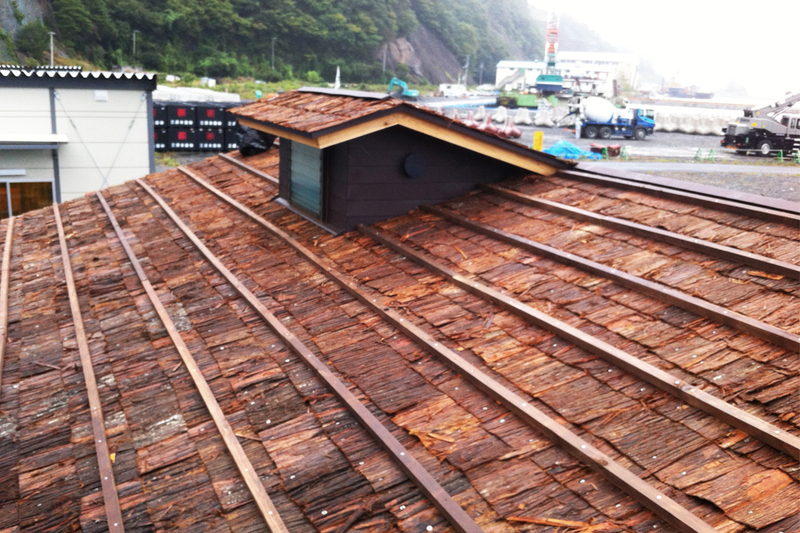 We were going to use the logs which were salt damaged by tsunami at first, but because time had passed since the wood had been cut, it could not be peeled by hand. So we decided to use the skin of the part normally wasted(ATE), and the root which is hard to be processed due to the cells being different from others.